An edition of God's Word created for guys ages 11 to 14 based on the best-selling "Life Application Study Bible." 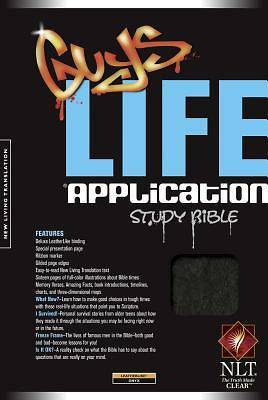 Packed full of notes and features, the "Guys Life Application Study Bible" is easy to use and helps answer the questions preteen guys may have about God and life. The notes help them learn to think biblically about real issues they face, such as self-esteem, friendship, and peer pressure. Discovering God's will for their lives has never been this much fun FEATURES: Age-appropriate notes, including: Freeze Frame--First-person narrations from the perspective of Bible characters about their own experiences and lessons learned What Now?--Unique, authentic scenarios about boys that are written in the third person, in a conversational format. Designed to leave readers to make their own decisions about real-life situations, while being pointed to Scripture for answers I Survived--Personal stories of how older teens handled situations tweens are currently facing I'm Not the Only One --Gives a lighter perspective on embarrassing situations Amazing Facts--Interesting tidbits of information from the Bible designed to engage readers in Scripture Is It OK--Answers to some tough questions based on what the Bible says Fashionable cover designs 16 pages of full-color illustrations walk the reader through Bible-time daily life and customs Presentation page "Greatest Stories" reading plan Index of well-known passages 8.75 font size The New Living Translation is an authoritative Bible translation, rendered faithfully into today's English from the ancient texts by 90 leading Bible scholars. The NLT's scholarship and clarity breathe life into even the most difficult-to-understand Bible passages--but even more powerful are stories of how people's lives are changing as the words speak directly to their hearts. That's why we call it "The Truth Made Clear."